But if you just fly over—or only see the high-profile articles covering West Virginia—you would never know that today, a wave of community transformation is underway. At the WV Community Development Hub, the positive momentum that comes with community revitalization is evident in the dozens of communities we work with and support across the state. Each of these places has a team of community volunteers—sometimes just five people, sometimes dozens—who come together week after week to build plans for community change. Our volunteers create plans and then implement them, one project at a time, over months and years. In Princeton, just ten miles from the border with Southwest Virginia, the Princeton Renaissance Project has been working for the last ten years to revitalize their community through initiatives involving public art, redeveloping downtown buildings to entice local businesses to relocate to the heart of their town, and community-wide events like the Halloween Mercer Monster Mash and the New Year’s Eve Downtown Countdown which attract thousands of residents and visitors to explore and enjoy downtown Princeton. Greg Puckett, a county commissioner and director of the local family resource network, has personally put in thousands of hours painting murals around the town. These murals are a dramatic physical display of the community energy and vitality that pulses through downtown Princeton. For a town of less than 6,000 residents, the murals, dozens of new community events, and new businesses downtown have demonstrated how a team of volunteers, through visioning, planning and action can truly transform a community. And it’s happening in dozens of other places, too. 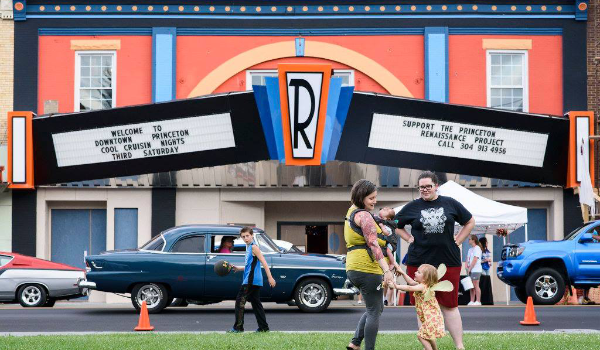 In 2009, residents in Huntington, WV launched Create Huntington, a grassroots network focused on spurring local residents to enact positive change in the community. While a multitude of initiatives and leaders have contributed to the city’s transformation over the past ten years—leading to Huntington being named America’s Best Community in a 2017 nationwide contest—the leadership, vision, and initiative of the Create Huntington volunteers has been a critical element. Create Huntington is a unique model of volunteer-led community change. It prioritizes community engagement and decision-making, creating multiple spaces for residents to engage, generate ideas and work on projects together, while being directed by a strategic plan and vision. And the group is not afraid to get creative! In 2017, Create Huntington held #WeBAM, a strategic plan launch that was disguised as a two-day party combining art walks, takeovers of abandoned buildings, food trucks, vendors, and lots and lots of music. The examples from across the state are too numerous to list. We do our best to highlight them each week on The Hub’s blog. A team of people come together who care deeply about their community and are ready to put some sweat equity into projects to make it better. That team is constantly inviting new people to get engaged, and creates open spaces for dialogue, discussion, planning, and project teams to get together. They make it fun. Community transformation works when it’s not just work, but it’s fun and inspiring. Projects that combine art, music, and community change are the ones that often engage the most people. And they keep at it! The work takes not just years, but decades. There will be setbacks, conflicts and challenges. But the communities—and the volunteers―who keep showing up, work through challenges, and who keep focused on the goal of community change are the ones who can look back after ten years and celebrate transformative impact. At The Hub, we are inspired every single day by the leadership that we see from residents in West Virginia communities. We are lucky to get to work with them and support them. And we will keep shouting from the rooftops that there is a secret story about this place that most people aren’t hearing: it’s a place of inspiration, change, and leadership. A native of Charleston West Virginia, Stephanie is the Executive Director of the WV Community Development Hub.